JUNE 2017: Be a STAR REFERRER & earn up to $1200/friend! Note: This is for GrabCar Partners who would like to refer their friends. Please click here if you have not been referred, to learn about our special incentive for you. We have upsized our JUNE Star Referrer specials which makes it even easier for you to boost your earnings just by referring your friends to us! Each friend you refer could earn you up to $1200 in cash when they complete 10 trips during their first 7 days of account activation. This means you get more cash payout, earlier. Simply share with us your friends’ contact details and let us sign them up for you. If they register and drive, you will earn your usual referral reward. It’s really that easy! *To enjoy these bonuses and incentives, drivers are required to sign up for the GrabRentals Loyalty Rental Rebate programme. Refer your friends and get rewarded with up to $1200 in cash, today! 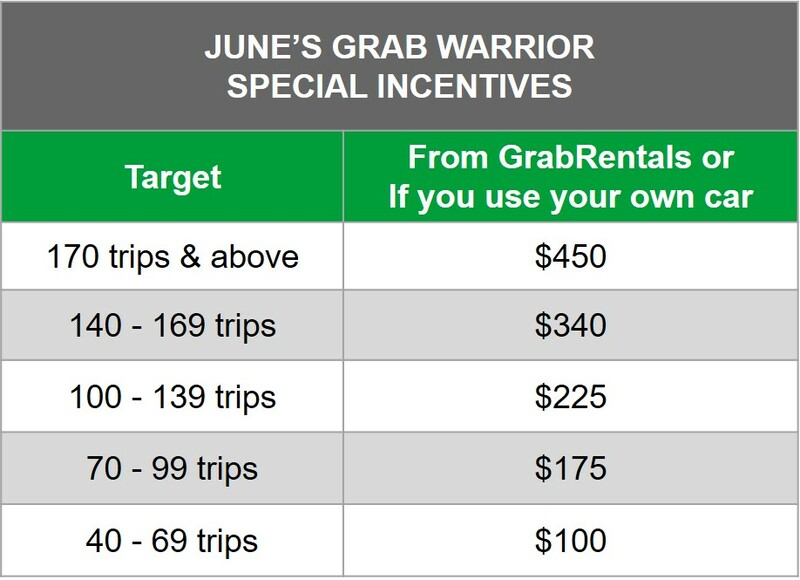 You can earn up to $450/week in incentives for the first 4 weeks with Grab. You could earn a total potential of $2,500 in incentives… and this is ON TOP of your own earnings. 20% commission refund is paid in Credit together with incentives. 3) Guaranteed 1.8X usual earnings in HIGH DEMAND AREAS, now including Bukit Timah! You can now enjoy guaranteed fare boosts of up to 1.8X in High Demand areas including Bukit Timah! If your fare is not at least 1.6X the usual fare, Grab will top up the difference. Eligible trips are unique passenger trips on GrabShare, GrabCar Economy 4 & 6-seater, GrabFamily & JustGrab. Q: How do these UPSIZED rewards work? Receive up to $50 when they activate their Grab account. Receive 10 trip reward (see table above) when they complete their 10 trips within 7 days from their date of activation. 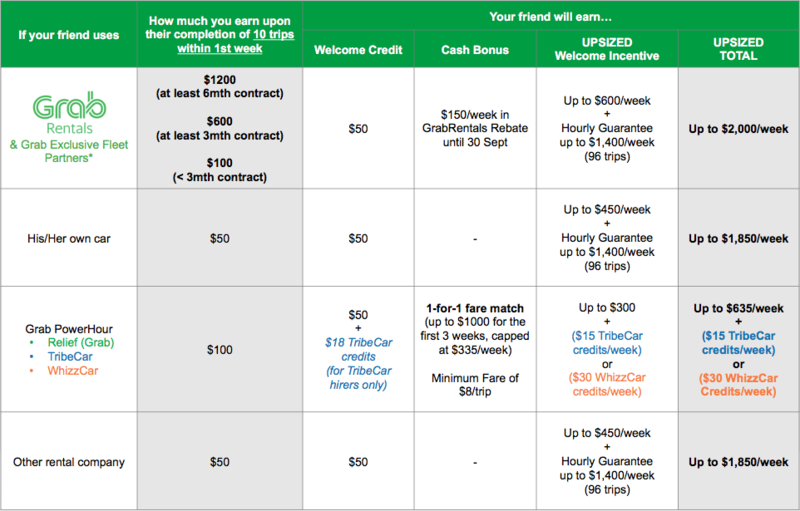 Earn up to $2000 weekly (see table above) with Grab. This amount is on TOP of their earning with Grab. The best part is: You will still get $100 when they complete 10 trips within 7 days of account activation. Rebates up to $150/week. Details here. Trips definition: GrabCar Economy 4 & 6-seater, GrabCar Premium, GrabShare, GrabFamily & JustGrab unique passenger trips only. For REFERRER: Paid in CASH if NEW DRIVER completes 10 trips within 7 days of account activation. Payment made by Week 4.